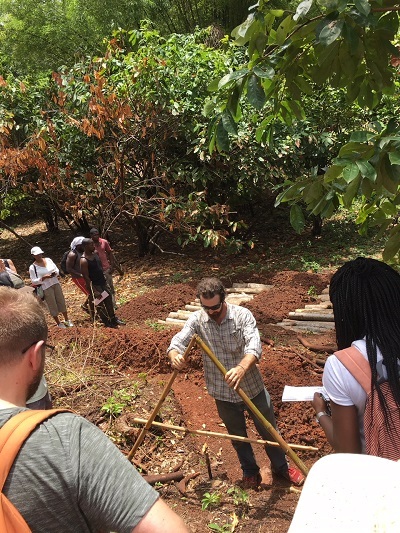 The people of Grenada are working to change chocolate into something to be grown in a sustainable way, alongside other important crops like nutmeg to balance income sources. 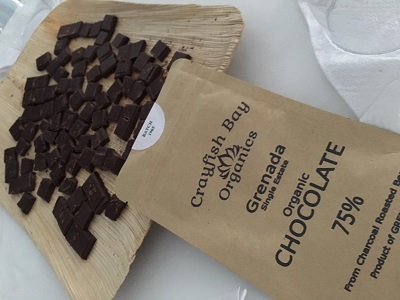 Grenada as an island of growers has also come together to work on improving the flavour characteristics of the chocolate we enjoy, as well as not using slave labour. As a result of growing superior cocoa, they are getting paid more for that cocoa, encouraging families to reclaim their cocoa plantations. There is also a push to increase chocolate-focused tourism to the island – it’s a grass-roots effort and it is working. In fact places like Crayfish Bay are not only making organic chocolate, they also offer eco-tourism on their farm. Chocolate comes from a fruit grown on a tree only within twenty degrees of the equator. 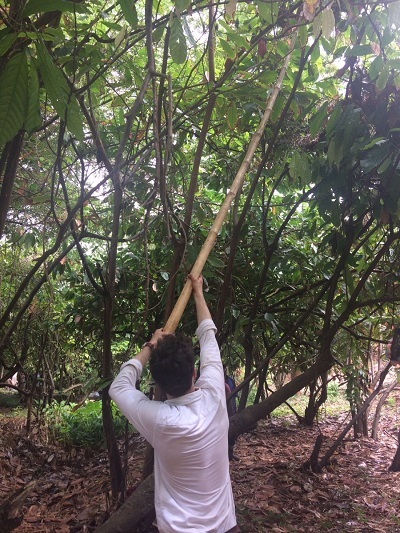 It requires manual harvesting to protect the tree and is susceptible to disease. It requires a lot of pre-processing in origin before it can be turned into actual chocolate. It’s a process few people get to see but Grenadian chocolate grower Belmont Estate hopes to change this. 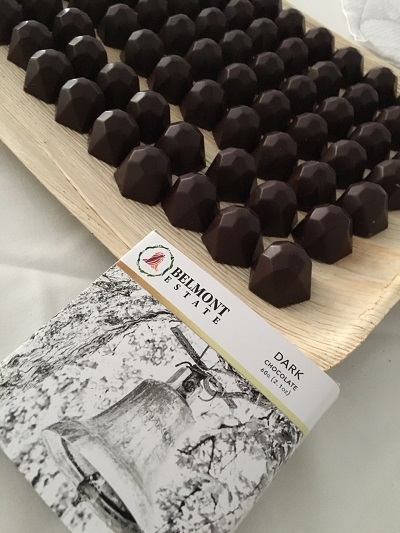 Belmont Estates are using their resources to create a visitor-friendly chocolate tour from tree to bar, with visitors able to see every part of the process. 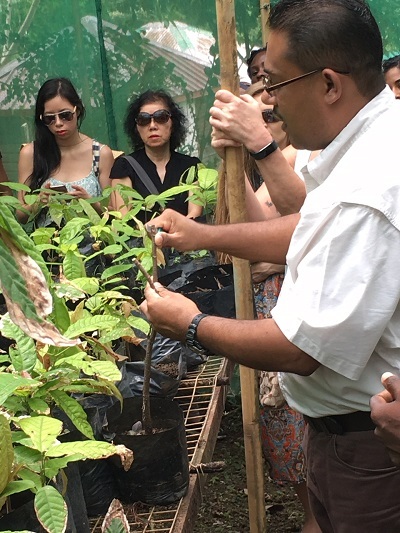 It is a unique experience to see the trees up close, smell the fermentation tanks, learn about grafting, dance in the cocoa and see it being turned into chocolate. To be such an intimate part of the chocolate-making process helps us better understand our chocolate. 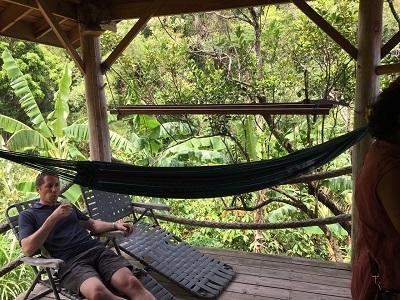 Tri-Islands Chocolate Farm are also hoping to change how chocolate is grown, but in this case it is to prove to other cocoa farms that cocoa can be grown in a sustainable and organic way. Using an expert to help them rebuild the ecosystem and create a profitable farm, Tri-Islands are gambling that consumers and chocolate makers will pay more for their organic premium beans as is already happening with Crayfish Bay. The Tri-Islands farm has been reclaimed from being abandoned like so many cocoa farms on Grenada. It isn’t very profitable to grow and harvest cocoa and so it makes these farms less valuable and therefore prone to being abandoned. If cocoa remains unprofitable, we’ll lose our chocolate through loss of the farmers willing to grow and harvest it. With trees only in their peak growing years for around 20 years, cocoa farms abandoned for a generation are not only often too tall to harvest effectively, they are also past their prime. That’s why it is not only important to reclaim farm but highlight more Grenada chocolate. The job of promoting Grenada cocoa to the world has fallen to another island resident, Magda Fielden, who owns True Blue Bay with her husband Russ. She is the driving force behind the island’s annual Chocolate Festival which works hard to highlight the locally produced cocoa, food, and crafts (including jewellery and clothing), as well as educating attendees about all aspects of the cocoa chain. This is a local festival which aims to have a global reach for an important reason – we need to pay more for chocolate. 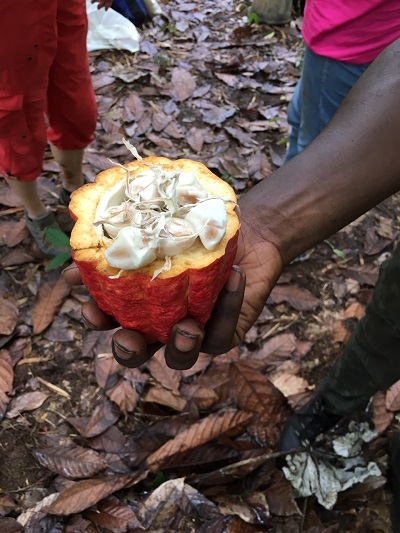 There are talks, workshops, tastings and trips out to cocoa plantations all aimed at educating people about the island, their cocoa and why we need to pay more for our chocolate. Chocolate must be harvested by hand, fermented and dried over a period longer than a week, roasted to perfection before being cracked, winnowed, refined, have sugar added and expertly conched and tempered before being made into our chocolate. Each step, from ensuring the trees are free from disease, through perfection in fermentation, the right roasting time and temperature, to the right conch, sugar and milk powder levels, requires time and expertise. Given the complexity of chocolate, this is why we are paying too little for our chocolate and why everyone on Grenada, as well as elsewhere, is trying to change this. I’m glad you had the opportunity to check out the chocolate scene in Grenada. It is one of my favourite Caribbean chocolate destinations. And the chocolate is SO good!